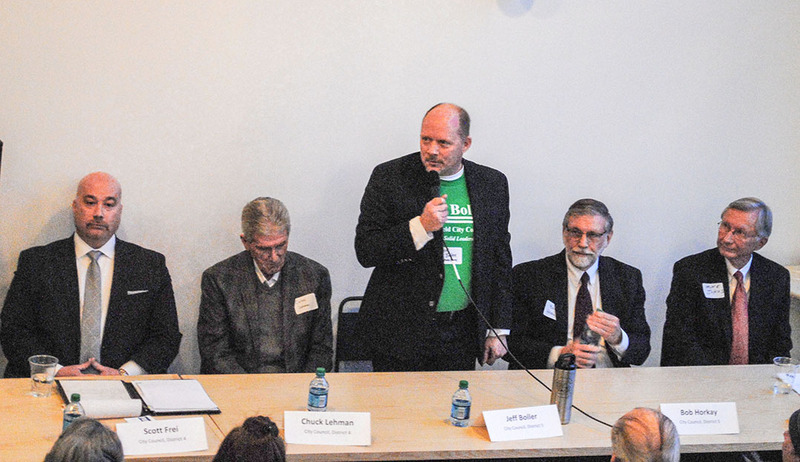 On March 7, members of the public had the opportunity to hear several Republican city council and clerk-treasurer candidates participate in a Q&A session at Field Brewing in Westfield. Council member Chuck Lehman, the District 4 incumbent, said although the city has created a wealth of jobs in the youth sports field, he believes the focus needs to turn to STEM-related jobs in science, technology, engineering and mathematics. “We need to become a city that has a destination of workers of a higher level. Sports are great, but we need to develop that workforce where people come here,” he said. Scott Frei, a council candidate for District 4, said he hopes Westfield doesn’t lose its identity five years. Council member Jim Ake, an at-large incumbent, said expects taxes to decrease in the next five years. At-large council candidate Troy Patton said if the city doesn’t have financial clarity, the schools will suffer. At-large council incumbent Cindy Spoljaric said she wants to revisit the city’s 2007 comprehensive plan within the next five years. “I would like to see the (comprehensive) plan in its entirety reviewed again to see if we’re really still on that same path and how we can make it stronger,” she said. Jake Gilbert, a council candidate for District 2, said he wants the city to grow in all areas but still keep the small-town feel that inititally drew people to Westfield. Mike Johns, a council candidate for District 5, said he also would like to revisit the comprehensive plan. Council member Bob Horkay, the District 5 incumbent, said he expects the city to maintain its small-town feel in five years but will be as easier place for residents to get around. Jeff Boller, a council candidate for District 5, said he foresees a bustling downtown in Westfield in the next five years. Havard said financial accountability and transparency were the most important functions. Gossard said she has been a good steward to the city, and that she already holds herself and her staff accountable. She also responded to Havard’s data-driven decisions comment by saying she’s not sure certain data needs to be entered. District 1 council candidate Scott Willis, District 3 council incumbent Joe Edwards and Mayor Andy Cook didn’t participate in the Q&A because their races being uncontested. Bob Beaudry, a council candidate for District 2, wasn’t present. Donald Rainwater, a Libertarian council candidate for District 4, also didn’t because the event was conducted by the GOP.